One of the most frequently asked questions by my readers are what kind of rice cooker and wok do I use? And what brands would I recommend for those? With Christmas approaching, I thought I might share some of my favorite kitchen tools I use day to day in my kitchen, so that you can use this information as your shopping guide or, even better, request to your family and friends that you want one of these. 😉 Good idea?! Out of curiosity, do you own any of these tools in your home? If so, which one? Anyway, I hope you find this guide useful! Cuckoo IH Pressure Rice Cooker : This is my beautiful rice cooker made by Cuckoo. It is an induction heating pressure cooker so it distributes the heat evenly and thoroughly. I’ve owned this one (model number CRP-HYXB1010FB) since June 2013. I actually ordered it from Korea so I’m using it with an Australian power adapter. I had owned a different Cuckoo rice cooker before this as well. You can view the picture from here. I don’t know all the technical details but what I know is that my rice cooker cooks the most delicious rice. It always gives me rice with just right – nice, fluffy and moist – texture. It’s also very easy to clean inside and outside. (It has an internal steam cleaning function so you can always keep the rice cooker clean even internally!) It is also very sturdy, nothing like the cheap $10 rice cooker you can buy from a supermarket. I keep my rice cooker out permanently on the kitchen bench as I use it everyday (sometimes I use it twice a day!). 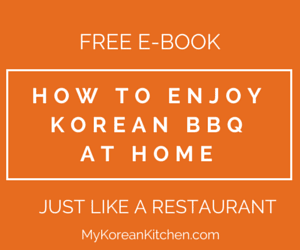 It speaks three different languages – Korean, English and Chinese. (I set mine to English so that my husband can cook the rice as well, which is quite handy.) The “only downside” I can think of is the price. I think I paid close to USD $500 for this one but I consider it as an investment as it saves my time and gives me consistently great results (as long as the water to rice ratio is correct). It has many settings so you can not only cook rice, but you can also cook rice porridge, bake cakes and do so much more. Unfortunately I’m just too busy to utilise all the functions it has to offer at present but it’s all there! You can use it as an electric pressure cooker as well. I’ve steam cooked beef dishes with this before. Cuckoo is by far the most well known rice cooker maker in Korea. They seemed to release a new and improved rice cooker every 6 months, so you should be able to get more advanced models now. Lodge skillet (10.25 inch & 12 inch) with lid : These are my go to skillets for my everyday cooking. (Basically I use them as my wok.) I love using cast iron pans as they are cheap and easy to maintain. I also do think food tastes better even though it could be a psychological thing! The only downside to using a cast iron skillet for me would be the heavy weight compared to a non-stick pan but I consider it as my arm muscle building opportunity as I normally don’t get to exercise. lol FYI, I use these mainly on my induction cooktop. You don’t have to have a gas burner to use these ones! I’ve been using them for over 2 years now. 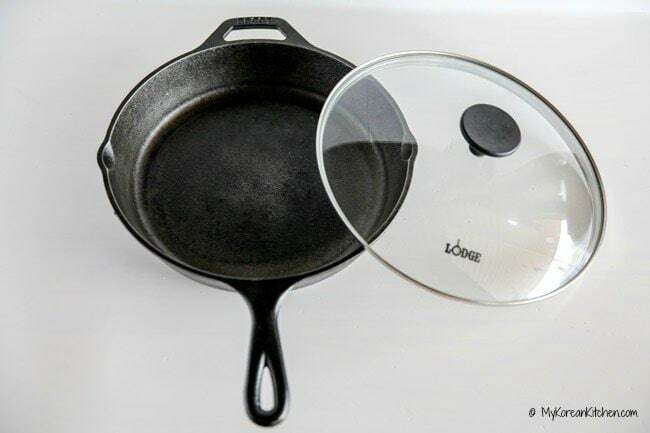 Before these, I used to use non-stick pans and I got tired of throwing them away every few months when they got scratched. Now I don’t need to worry about throwing my money away anymore! Also when I bought the skillet I bought the lid as well. I didn’t think I would use it much but surprisingly it is so handy to have a lid that fits perfectly onto a skillet. It’s great for lightly steaming during stir frying and speeding up the cooking. If I were to add a proper wok into my kitchen tool inventory, I will buy a lodge wok as I love their skillets! 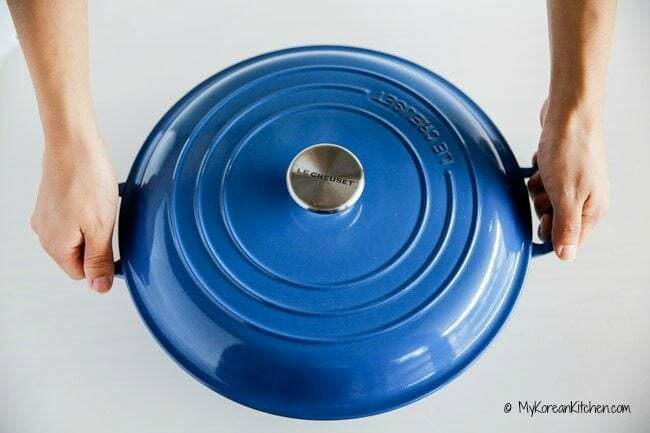 Le Creuset Signature Enameled Cast-Iron 3-1/2-Quart Round Braiser : This is my favourite braising pan. It heats up slowly and distributes the heat evenly. The food cooks well and keeps the moisture so well without over simmering the sauce. I used this pot in my latest cookbook for the Spicy Braised Mackerel and Radish recipe. It gave me consistently excellent results. It’s also good for Korean style hot pot (e.g. budae jjigae (Korean army stew) and gamjatang (pork bone soup)). 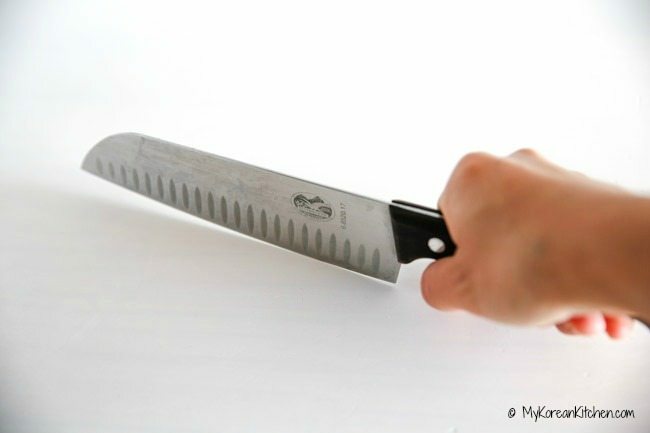 Victorinox 7-Inch Granton Edge Santoku Knife : I was introduced to this santoku knife about 2 years ago and I love it because it fits my small hand very well. It’s also very versatile and it cuts well of course too! I actually also own a more expensive brand’s (Wusthof) santoku knife but I prefer using the Victorinox one for my cooking. Food just seems to slice better and easier with it. 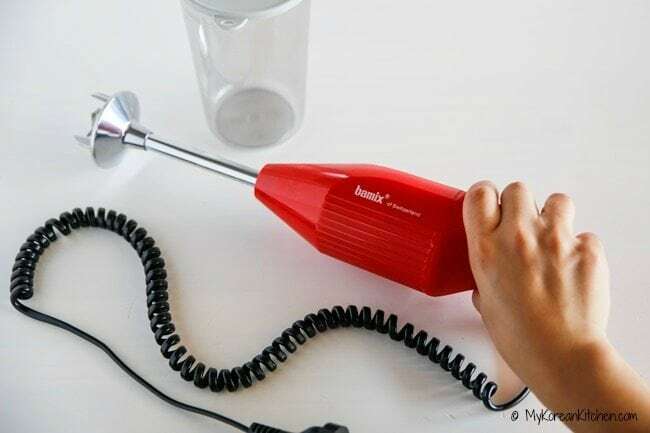 Bamix Mono Hand Mixer : This one was a gift from my husband for mother’s day. Before this I only had a stand alone type mixer – Vitamix, which I also love. But for general cooking (e.g. making Korean BBQ marinade and Kimchi base) I wanted a handheld mixer as it works better than the stand alone type with the food that has little liquid. My husband chose this brand because his grandma and also his mom used it for decades. 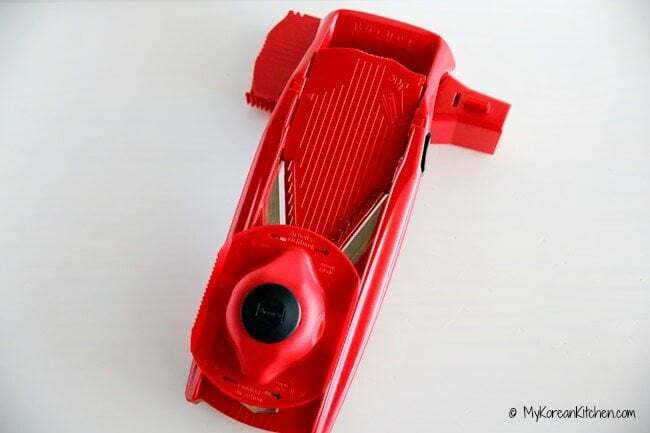 Swissmar Borner V Power Mandoline, V-7000 : I love using this borner mandoline slicer. It makes julienning so much faster and easier with minimum effort! I had owned other Australian brand mandolin slicers in the past but they were really hopeless in performance, so I gave them away to charity. 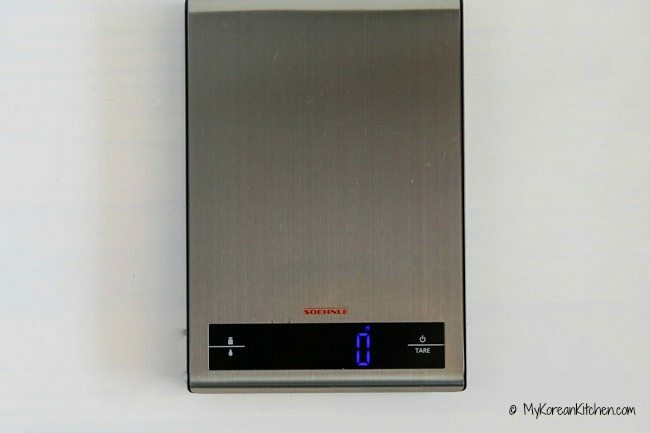 Soehnle Attraction Professional Kitchen Scale : I love measuring things. With this digital kitchen scale, I am able to measure my cooking ingredients accurately. It can measure weight and volume. You can also measure in grams or ounces. OXO Good Grips Large Silicone Flexible Turner : I think this is one of the best spatulas I’ve tried so far (particularly for non-stick pans) and it’s great when flipping (Korean) pancakes. It’s flexible and can support reasonably heavy pancakes such as Korean seafood pancakes (Haemul Pajeon). 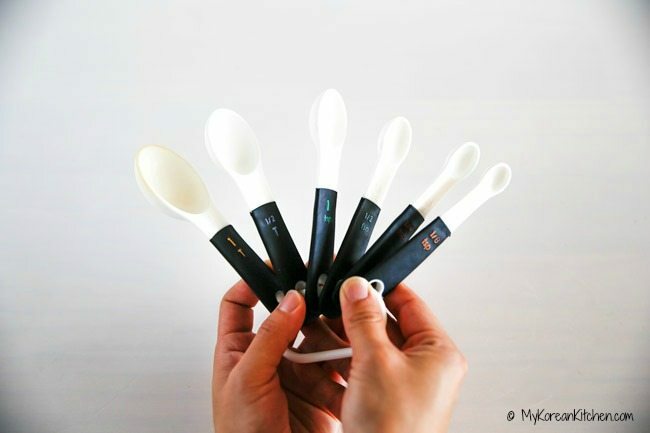 OXO Good Grips 6-Piece Measuring Spoon Set : It is very handy to have 6 different size measuring spoons. I particularly love having 1/2 Tbsp and 1/8 tsp. I use all of them all the time. They are dishwasher safe too. Though when I use these for Gochujang (Korean chili paste) or Kimchi I rinse them immediately after use as they can stain the spoon. You can also get these in black from Amazon. 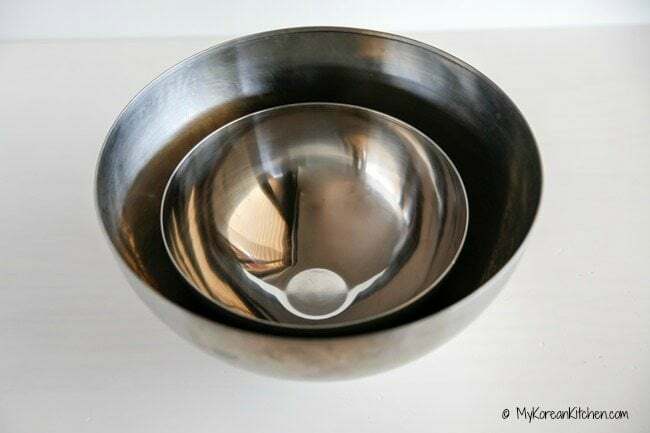 IKEA Blanda Blank Serving Bowl : These are made with stainless steel and are sturdy and very handy to have. I own a couple of these mixing bowls in different sizes. I use 11 inch (28cm) bowls a lot for making small batches of Kimchi and marinating Korean BBQ meat. I love your blog. I am a Kiwi living in Japan, and am planning on taking my Japanese rice cooker (1200w) home with me to NZ later this year. Would you mind sharing what kind of adapter you are using? I have bought an adapter to use with my rice cooker (a 1200w step down transformer to convert NZ 240v to Japanese 100v, but the adapter package says it cannot be used with rice cookers. Have you had any problems with yours? Thank you!! Hi Katie, check this comment in regards to the adapter I’m using. 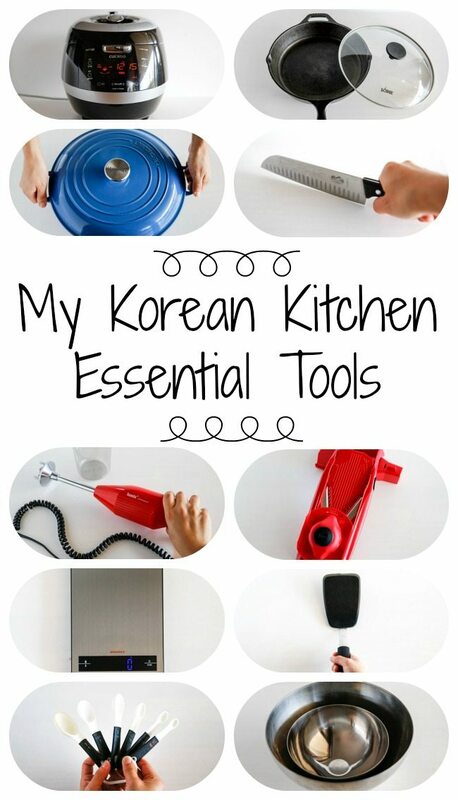 https://mykoreankitchen.com/my-korean-kitchen-essential-tools/comment-page-1/#comment-409409 I don’t remember any warning messages, (I bought it 10 years ago!) and I haven’t had any problems all these years. Hope this helps! Thanks so much for your reply and the link Sue, I’ll do some research! After using this Victorinox 7-Inch Granton Edge Santoku Knife, i felt like you. Thanks for introducing us to use this. Awesome knife. Great to hear that, Julie! Like the story of the rice cooker. Definitely will search for that korean rice cooker. This looks interesting to me. Thanks for the share!!! I have just got a Cuckoo IH high pressure 10cup, but I am struggling a bit to get some proper basmati rice with it, it comes out sticky. I think I have the same cooker as you. I didn’t find any glutinous rice setting to work well for either basmati or jasmine rice. You might want to try the mixed grain setting –I haven’t tried it. After a couple of experiments with jasmine rice I went back to using my old Zo IH non-pressure rice cooker for jasmine and basmati rice and I keep the Cuckoo for short grain and mixed grain rice. I really bought it for the mixed grain rice function so it was well worth it to me. Try nutritious rice setting. I’ve been using it for my Jasmine, long grain white rice and comes out just the way I want it. I use 1 portion of rice to an equal portion of rice, disregarding the instructions on the rice packaging. For example, I use 1 cup of basmati rice and 1 cup of rice in my 6 cup, pink cuckakoo induction heat rice cooker and the basmati turns out great. When I followed the rice package instructions, the basmati was a sticky glumpy mess. I meant to sat 1 cup of water to 1 cup of basmati rice. Thanks for your clarification! 🙂 Glad to hear your basmati rice still works well on Cuckoo rice cooker! I will try the 1 to 1 ratio too. Which setting on your rice cooker did you use? Thanks! I moved from Korea to the UK recently and was probably most excited to see my Cuckoo rice cooker after my household items finally arrived! 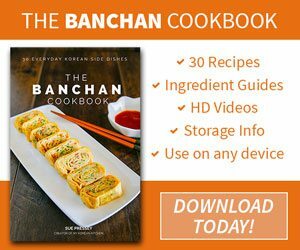 I found this thread after searching how to cook basmati rice in a rice cooker with Induction Heat / Pressure Cook functions. I saw a tip elsewhere to do a 1:1 ratio of basmati rice and water + a little butter and salt . Tried that last night on the Quick 백미 (Quick “white (sushi) rice”) setting. Rice was done in 18 minutes and I was happy with the results! I will add a touch more water next time, but I think a 1:1 water to rice ratio is a good starting point for long grain rice. We just had our first korean meal in a restaurant yesterday. The cabbage was so finely shredded – less than 1 mm I would say. What would you use to shred this finely? Hehe, but it’s a really good rice cooker and it can cook many dishes, not just rice. Also it’s also very well made and I’m sure it will last many years. Hi Mel, I think I bought my adapter from Big W. It was a long time ago though. (But I’m still using it every day.) It looks very similar to this one. https://www.bunnings.com.au/korjo-multi-reverse-travel-adaptor_p4420320 (I couldn’t find a similar one from Big W.) Also, my adapter doesn’t convert the voltage. I bought my rice cooker from Korea (220V) and it’s close enough for Australian standard (230V). I’ve been using it fine without any problems since 2013. Also, my previous rice cooker from Korea (between 2007 to early 2013) worked fine as well. Hope you can start using your new Cuckoo soon! 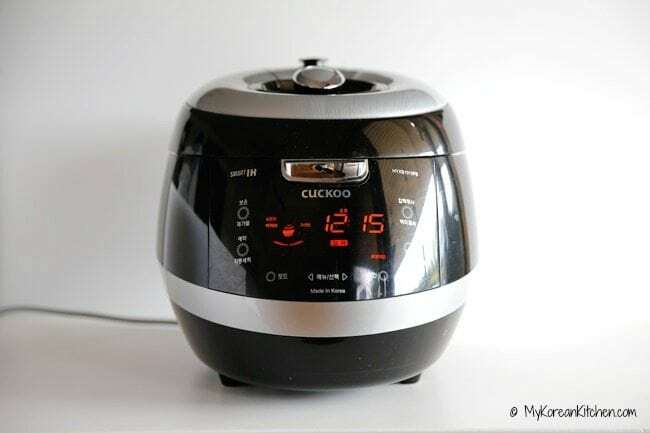 I always prefer to use Cuckoo rice cooker as it is easy to use and is of good quality. Thanks for all your recommendations for the list of essential kitchen tools. I just bought the newest Cuckoo pressure rice cooker so I can cook mixed rice more easily. But I was wondering, can the Cuckoo rice cooker cook Thai jasmine and Indian basmati (both white, long grain rices) well? I’ve heard that it’s really only meant for medium and short grain rices. (My daily rice is white, short grain rice.) Thanks for any advice. Great! Do you use the same amount of water as the water level lines on the rice cooker or do you need to adjust it? I don’t really use the water level lines. I use my knuckle as a guideline. 🙂 Refer here. 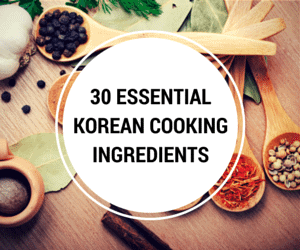 https://mykoreankitchen.com/how-to-make-perfect-korean-steamed-rice-step-3-how-to-soak-and-cook-the-rice/ In essense, I didn’t change my method between the jasmin rice and short/medium grain rice. FYI, long grain rice could turn out less fluffy using IH pressure rice cooker. Hi. Which Cuckoo Menu setting and water level you recommend for the long grain rice (like jasmine rice)? Many thanks. (On a rare occasion) When I cook long grain rice, I just use the “glutinous rice” – 백미 (Baekmi) setting. The water level is also same as what I would normally do for short/medium grain white rice. Hi. I also found some advice on the other IH rice cooker manufacturers site. They suggest using “Mixed rice” mode and 1-1.25 cup of water to 1 cup of rice ratio. For me long grain is as important as short grain, since I love Thai and Indian food. I have to try both options. Oh, I didn’t know that! Awesome! I will share more recipes in the future, so stay tuned! We have Korean neighbors who leave their cooking utensils out in the sun during the day. Is this a Korean custom and why is it done?? omg Sue thank you so much for posting this knife recommendation. I bought a different brand but it is a Santoku like yours with the ridges on the side and it. is. the. best. thing. evAr. Completely blows all of our other knives out of the water and into orbit in space ^<__<^;; It goes through everything I cut so easily. I was slicing shiitake earlier which is always such a chore with our other knives that I usually just slice the amount I immediately need and put off the rest til when I need it again, but it was so easy with this knife that I finished all of the shiitake I had in like 10min. ^o__o^;; Thanks again, I'm sure we will get so much use out of this knife. Love the Kitchen scale, the knife and Spatula choice. Rice cooker not so much. I bought an expensive rice cooker but it started deteriorating and then I dropped it. Suffice to say it was toast. So I went back to an inexpensive rice cooker than handle some rough use without damaging the electronics. Oh yeah I have those Ikea mixing bowls too. They are brilliant.